The quarter final stage of this season’s KNVB Beker got underway on Tuesday evening at De Grolsch Veste where three goals in the space of sixteen second half minutes saw FC Twente end Eerste Divisie outfit, Cambuur’s hopes of making a second successive appearance in the final four of the competition. Having amassed a formidable cup pedigree over the course of the past two seasons, the away side appeared on course to claim yet another big scalp when Nigel Robertha sent an untracked Mathias Schils clear to slot the ball past an onrushing Joel Drommel from just inside the area to break the deadlock twelve minutes before the break. Despite enjoying a half time lead, the visitors would find themselves pegged back just before the hour when the home side were handed the opportunity to restore parity after Martijn van der Laan pulled Tom Boere to the ground on the edge of the box, leaving Oussama Assaidi to dispatch the resultant spot kick. Buoyed by the Moroccan’s strike, the hosts would edge themselves ahead just eight minutes later when Adam Maher curled a free kick from just outside the area into the top left hand corner of Erik Cummins’ net before striking again fourteen minutes from time with a spectacular long range effort that left the visiting ‘keeper grasping at thin air to dispel any hopes the visitors may have harboured of staging a late comeback. 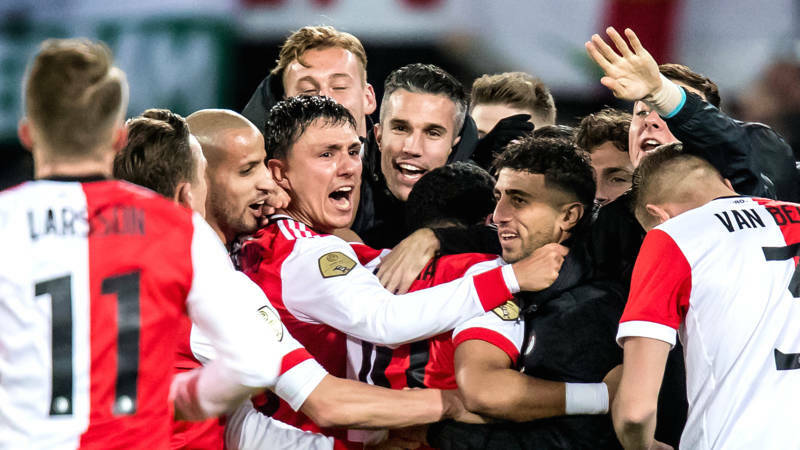 Wednesday’s cup action got underway at the AFAS Stadion where four-time cup winners, AZ Alkmaar remained on course to lift the trophy for the first time since 2013 by hitting an undermanned PEC Zwolle for four. Buoyed by having claimed their first victory since the turn of the year by scoring twice in the opening fourteen minutes of their encounter with Willem II on Sunday afternoon, it took just twenty-one minutes for John van den Brom’s men to break the deadlock when, having been set away by a long ball from Stijn Wuytens, Wout Weghorst shrugged off the attentions of Dirk Marcellis and chipped the ball delightfully over an onrushing Diederik Boer to put his side a goal to the good. Despite Wouter Marinus restoring parity for the visitors by glancing home a skewed effort from Younes Namli on the edge of the box just ten minutes later, when an untracked Guus Til ghosted in to fire home an Oussama Idrissi corner five minutes before the break things would swing back in the home side’s favour and when visiting ‘keeper, Boer was given his marching orders by referee, Bas Nijhuis, for handling the ball outside his area after haring off his line to snuff out an Alireza Jahanbakhsh-led breakaway nine minutes after the restart, John van ‘t Schip’s side were left with the proverbial mountain to climb. Any thoughts of a comeback were dispelled just six minutes later when, having drawn the attentions of stand-in ‘keeper, Mickey van der Hart, Weghorst picked out an unmarked Idrissi at the back post to make it three before the AZ skipper claimed his second of the evening after being slipped in by an unselfish Jahanbakhsh seconds after the Iranian international had been sent clear by an incisive through ball from Fredrik Midtsjø nineteen minutes from time. The night’s action was concluded at De Kuip where 2016 cup winners, Feyenoord ended table-topping, PSV Eindhoven’s hopes of securing a double in the tie of the round. The importance of this game wasn’t lost on the hosts who took just three minutes to break the deadlock when Sam Larsson beat Santiago Arias to slide the ball into an unguarded net after Jeroen Zoet could only partially block a low drive from Steven Berghuis, whose swift give and go with Nicolai Jørgensen had unhinged the visitors back line seconds earlier. With any chance of defending their Eredivisie crown now long gone, the home side ensured that they would remain on course to add to August’s Johan Cruijff Schaal triumph when Tonny Vilhena doubled the host’s lead with a deflected strike from just outside the area after the away side could only partially clear a Larsson corner from the left ten minutes before the break. Giovanni van Bronckhorst’s side might have made their victory even more emphatic but, despite initially allowing a 59th minute effort by Jørgensen, referee, Pol van Boekel later chalked off the Danish international’s strike after consulting with the video referee as replays showed the 27-year-old to have strayed marginally offside as Renato Tapia set him away with an incisive through-ball. Despite seeing Brad Jones palm a Mauro Junior free kick onto the bar just three minutes later there ultimately proved to be no coming back for PSV as the hosts held on to claim a semi-final berth. The one remaining quarter final tie took place on Thursday evening in Tilburg where penalties were required to separate hosts, Willem II and Roda JC, with the home side edging out their guests 5-4 to claim a place in the last four of the competition. Despite a covering Daryl Werker clearing a goal-bound effort from Fran Sol off the line thirteen minutes in and Fernando Lewis striking the foot of Hidde Jurjus’ right hand upright just three minutes later, the tie would remain scoreless until eight minutes before the break when, with Fernando Lewis having been penalised for pulling a marauding Jannes Vansteenkiste down inside the area, a nonchalantly taken spot kick from Feyenoord loanee, Simon Gustafson put the away side into a somewhat undeserving lead. However, the visitor’s advantage would last just two minutes before Vansteenkiste’s attempted clearance of a Thom Haye free kick fell invitingly for Bartholomew Ogbeche to nod the ball beyond a static Jurjus. The visitors would restore their advantage three minutes into the second half when Schalke loanee, Donis Avdijaj cut in from the left and unleashed a blistering drive into the top left hand corner of Mattijs Branderhorst’s net. However, the home side would claw their way back onto level terms for a second time just after the hour when a deflected Konstantinos Tsimikas free kick found its way past Jurjus and the host’s Greek defender might have secured his side’s place in the final four in similar fashion were it not for a covering Henk Dijkhuizen, who was on hand to head the 21-year-old’s 66th minute set piece off the line. With the game headed for extra time the away side looked to have snatched a late winner but Avdijaj’s 82nd minute effort was ruled out by the video referee, who deemed Mikhail Rosheuvel to have handled the ball earlier in the move. The hosts might have snatched it at the death when Haye saw his volley from just outside the area clip the outside of Jurjus’ left hand upright seconds after Christian Kum had cleared an Ogbeche effort off the line when another Tsimikas free kick sparked chaos inside the visitor’s box in the first minute of added time. Despite Mohamed El Hankouri striking the foot of Jurjus’ right hand upright with a low drive from the edge of the area seconds after replacing Haye during the break in extra time, the game would go to penalties with the decisive moment coming when, with the hosts having converted all five of their spot kicks, second half substitute, Tsiy William Ndenge saw his attempt saved by Branderhorst.